Library Hours: Monday-Thursday | 9 a.m.-9 p.m. Friday & Saturday | 9 a.m.-6 p.m. Sunday | 1-6 p.m.
How to Register ... ... for general library events. General library events, on Pages 6-15, are free. Some events require registration and some do not, which will be indicated on the event description. Online: Go to salinapubliclibrary.org and click on the calendar icon. By phone: Call (785) 825-4624. In person: Stop by the Information Desk, the Technology Center Help Desk or the Youth Services Desk. In person: Visit the McKenzie Center, 308 W. Elm, 9 a.m. to 5 p.m. Monday-Friday. Dropbox: Leave your registration form and payment in the secure drop box on the front of the McKenzie Center. More on CLASS registration can be found on Page 16. We’re calling on the community to demonstrate the value of reading! It teaches. It keeps the mind sharp. It transports and entertains. Spend some time reading (or listening to) books this summer and add to the community tally. Adults can enter weekly drawings for Salina Area Chamber of Commerce gift certificates by logging the books you are reading. Each book review you write enters you into an additional drawing for gift certificates to local events and venues, such as Smoky Hill River Festival buttons and Kenwood Cove passes! Simply complete a book log or review form at the library or online at www.salinapubliclibrary.org. Adult Summer Reading is designed for those 18 and older. You must log your reading to enter drawings for prizes and attend the Summer Reading Open House. Only books read between Friday, May 24-Thursday, July 25, should be logged. Summer learning worksheet packets will be available in the Technology Center beginning May 18. Children up to age 13 can complete packets to earn a drawing entry for endof-summer prizes, like science kits, LEGO sets and family games. You will receive an entry ticket that you can place in the drawing of your choice. The last day to return packets is July 19. Additionally, each educational class hosted by the Technology Center that you attend gives you an entry. Dates for classes can be found on Page 12. To kick off Summer at the Library, youth who come to the library from May 19-26 can enter the drawing for the Early Bird Prize Package, which will include a youth membership to Kenwood Cove. Entry boxes will be in Youth Services. Friday, July 26 | 6:30-8 p.m. | Come and Go Tickets required* Location: Information Services The adults-only (18 and older), end-of-the-summer open house will include hors d'oeuvres, live music, and prizes, including the two grand prizes of a Kindle Paperwhite and Amazon Fire Tablet. *To qualify for a ticket to the open house, you can participate in Summer Reading by logging books, writing a review or attending Moon Presentation and Viewing, any movie, Anime Club or book discussion (Page 5). You must have a ticket to attend and to enter the open house prize drawings. Tickets will be available at the Information Desk from July 1422 for Adult Summer Reading participants. You must attend the open house to enter that eveningâ&#x20AC;&#x2122;s prize drawings, but do not need to be present for the drawings to win. We want to know about your favorite summer reads. Turn in this list between July 15-25 to Youth Services to receive your pass for the end-of-summer Youth & Teens Pool Party. Add as many books as you would like and remember to also log your books toward the community reading goal for a chance to win weekly prize drawings. Check the boxes if these books have been logged toward the community reading goal. For events that require registration, visit the online calendar at salinapubliclibrary.org or call (785) 825-4624. One-on-One Tech Help Wednesdays | 1, 2:30 OR 6 p.m. Saturdays | 10 a.m. Registration required. Location: Technology Center Need technology help? Register to receive individual, hands-on assistance from library Technology Center staff. Basic computer skills are required. The Genealogist is In! Monday, May 6 | 4 OR 5 p.m. Registration required. Location: Campbell Room Receive one-on-one genealogy help from an experienced volunteer. Moon Presentation and Viewing Thursday, June 6 | 7:30 p.m. All Ages No registration required. Location: Prescott Room Dr. Dorothy Hanna, a chemistry professor at Kansas Wesleyan University and president of the Salina Astronomy Club, will teach you about the moon. Afterward, as the sky becomes darker and the library closes, we will go outside and use telescopes to view the moon. Ballet on the Lawn with Tamara Howe Thursday, July 18 | 6:30 p.m. All Ages No registration required. Look for Dance Location: Caldwell Plaza Storytime with Join us outside on the lawn at Tamara Howe on Caldwell Plaza for a beautiful Page 11. ballet put on by The Tamara Howe School of Dance. Adult Events Adult Summer Reading Open House Friday, July 26 | 6:30-8 p.m. | Come and Go Tickets required Location: Information Services More information on Page 4. Family History Detectives Thursday, May 9 | 6:30 p.m. No registration required. Location: Prescott Room Come prepared to share your best genealogy finds with the group during the annual brag session. “The Nightingale” by Kristin Hannah Monday, May 13 | 7 p.m. No registration required. Location: Technology Center Conference Room Reunited when the elder’s husband is sent to fight in World War II, French sisters Vianne and Isabelle find their bond, as well as their respective beliefs, tested by a world that changes in horrific ways. "Hillbilly Elegy: A Memoir of Family and Culture in Crisis" by J.D. Vance Monday, June 10 | 7 p.m. No registration required. Location: Small Conference Room 2 “Hillbilly Elegy” tells the poignant story of the author’s family and upbringing, describing how they moved from poverty to an upwardly mobile clan while navigating the demands of middle-class life and the collective demons of the past. It is a passionate and personal analysis of a culture in crisis — that of poor, white Americans. "Looking for Alaska" by John Green Monday, July 8 | 7 p.m. Teens and Adults No registration required. Location: Small Conference Room 2 Sixteen-year-old Miles’ first year at Culver Creek Preparatory School in Alabama includes good friends and great pranks but is defined by the search for answers about life and death after a fatal car crash. “Recovery of an MMO Junkie” Wednesday, May 22 | 7 p.m. Teens and Adults No registration is required. Location: Prescott Room Moriko Morioka is logging out of real life and into the online world of gaming. Tired of the day-today grind, she’s giving in to the NEET (Not in Education, Employment, or Training) lifestyle by devoting her time to the online game, Fruits de Mer. Watch multiple episodes of the show, have a snack, and talk about it. This anime is rated TV-14. “Fullmetal Alchemist: Brotherhood” Wednesday, June 26 | 7 p.m. Teens and Adults No registration is required. Location: Prescott Room After Edward and Alphonse Elric commit a taboo of alchemy attempting to bring their mother back to life, the brothers become involved in political schemes while searching for the Philosopher’s Stone, which is said to have the ability to help recover their original bodies. Watch multiple episodes of the show, have a snack, and talk about it. This anime is rated TV-14. “Kino’s Journey, The Beautiful World” Wednesday, July 24 | 7 p.m. Teens and Adults No registration is required. Location: Prescott Room This is a story about Kino, who travels around the world with her talking motorcycle Hermes, having adventures and staying a short time in each place. Watch multiple episodes of the show, have a snack, and talk about it. This anime is rated TV-14. "Black Panther" Thursday, June 20 | 6 p.m. Ages 13 and older No registration is required. Location: Prescott Room T'Challa, also known as Black Panther, is heir to the hidden but technologically advanced kingdom of Wakanda, and must step forward to lead his people into a new future, confronting a challenger from his country's past. This movie is rated PG-13. “First Man” Thursday, July 18 | 6 p.m. Come early for an Ages 13 and older exhibit of NASA No registration is required. photos; Read more Location: Prescott Room on Page 6. A look at the life of the astronaut Neil Armstrong and the legendary space mission that led him to become the first man to walk on the Moon on July 20, 1969. This movie is rated PG-13. Google Forms Thursday, May 2 or 9 | 10 a.m. Registration required. Location: Technology Center Learning Lab Collect data with Google Forms, for free. Create surveys and polls, manage event registrations, gather email addresses for a newsletter, design a quiz and more. Forms can be emailed, linked from social media or embedded onto websites. Keyboarding Practice for Adults Saturday, May 4 or 11, June 1 or 8, July 6 or 13 | 9:30 a.m. No Registration required. Location: Technology Center Learning Lab Keyboarding is the first step to computer literacy and an essential skill in today's workforce. Using an interactive online program, current typists will learn how to become more proficient and improve their keyboarding skills. For those new to keyboarding, the program will teach you how to type using correct hand posture. Come when you can and improve your skills. Ice Cream Making Wednesday, July 10 | 2 p.m. Ages 11-17 years old Registration required. Location: Prescott Room Ice cream is fun to eat, but itâ&#x20AC;&#x2122;s also fun to make. Teens can make ice cream in a bag during this yummy program! Teen Events Gaming Stay ’n’ Play Friday, July 19 | 2 p.m. Ages 10-15 years old Registration required. Location: Technology Center Come play all afternoon in the Tech Center! Snacks will be provided. We will have a variety of gaming available. Minecraft and Fortnite will be running in the lab, Roblox on the Internet PCs, Virtual Reality for those 12 and older, PS4 and Switch gaming. Sunday, July 28 | 6:30-8:30 p.m. | Come and Go Tickets required Location: Kenwood Cove More information on Page 4. Brainy Babies Mondays & Wednesdays | 9:30 a.m. Ages birth to 2 years old No registration required. Location: Imagination Station Bring your little one to an interactive program with simple books, gentle movement and songs. Circus Storytime Wednesday, May 1 | 10:15 a.m. Ages 3-5 No registration required. Location: Prescott Room Join us for a special circus-themed storytime with books, rhymes, music and fun! Lil’ Picassos Friday, May 3, June 7 or July 5 | 10:15 a.m. Ages 18 months-4 years old No registration required. Location: Prescott Room Littles learn about color and texture during this hands-on program that allows them to experiment with art while having fun. Crazy 8s Math Club Mondays, April 1-May 20 | 4-5 p.m. Grades 3-5 Registration required. Location: Prescott Room Crazy 8s Math Club is designed to get elementary school kids fired up about math. Every week, kids get to build stuff, run and jump, make a mess and make friendships at the same time. It’s nothing like your usual math club. This club meets eight times, and signing up for the first meeting reserves your spot for the following weeks. For more information and to check availability, email Heather at youthservices.programs@salpublib.org. Mother’s Day Storytime Wednesday, May 8 | 10:15 a.m. Ages 3-5 years old No registration required. Location: Prescott Room Join us for good stories, rhymes, music and fun! Parachute Play Thursday, May 9, or Wednesday, July 31 | 10:15 a.m. No registration required. Ages 3-5 years old Location: Prescott Room Get ready to shake the chute and move your body at Parachute Playtime! Enjoy 30 activity-filled minutes that include music, creative movement and fun, all with one colorful parachute! Flower Bouquets Friday, May 10 | 4 p.m. No registration required. Ages 5-11 years old Location: Prescott Room Get ready to celebrate Mom! Join us and make coffee filter flower bouquets for Mother's Day. Kids on Canvas Tuesday, May 14, June 11 or July 9 | 6 p.m. Ages 6-17 years old Registration required. Location: Prescott Room Experience painting on canvas paper or canvas board using acrylics. Music Storytime Wednesday, May 15 | 10:15 a.m. Ages 3-5 years old No registration required. Location: Prescott Room Join us for stories, music and fun! Dance Storytime Tuesday, May 21 or June 18 | 10:15 a.m. Ages 3-5 years old No registration required. Location: Prescott Room Join us for this active storytime that combines great stories and movement. Dance Storytime is offered every third Tuesday at 10:15 a.m. and is hosted by Tamara Howe School of Dance. Book BINGO Friday, May 24 | 10:15 a.m. Ages 5-10 years old No registration required. Location: Prescott Room Kick off the Summer Reading Program by winning books! Join us for Book Bingo for your chance to win a great book. There will be an afternoon session for ages 11 and older; check Page 8. Dinosaur Storytime and Fossil Hunt Tuesday, May 28 | 10:15 a.m. Ages 0-12 years old No registration required. Location: Lakewood Discovery Center Join us at the Lakewood Discovery Center for a storytime about dinosaurs. Afterward, we will go hunting for fossils! Storytime Wednesdays or Thursdays, May 29-July 24 | 10:15 a.m. Ages 3-5 years old No registration required. Location: Prescott Room Join us for stories, rhymes, music and fun! Book Buddies Thursday, May 30, June 27 or July 25 | 2, 2:15, 2:30 OR 2:45 p.m. Ages 6-10 years old Registration required. Location: Prescott Room. Practice reading tail-waggin’ books during a 15-minute session with the best listener ever. Our canine friend, Ari, creates a supportive environment in which young readers can build confidence and have a doggone good time. Mr. Stinky Feet Thursday, May 30 | 6:30 p.m. Families No registration required. Location: Caldwell Plaza “Mr. Stinky Feet" Cosgrove has been delighting audiences for over two decades with his high energy, interactive concerts. Jim’s philosophy is that children are the stars of his shows, not him. Come prepared to sing, dance and have fun! In case of bad weather, any event scheduled for Caldwell Plaza will meet in the Prescott Room. LEGO® STEM — Wind Racers Thursday, June 6 | 4 p.m. Ages 5-11 years old Registration required. Location: Prescott Room Join us for a fun LEGO® building challenge – engineering wind powered LEGO® contraptions! Storytime with Rolling Hills Zoo Monday, June 10 | 2 p.m. Ages 3-5 years old No registration required. Location: Prescott Room Join us for a quick storytime, and then the staff from Rolling Hills Zoo will do an educational and fun Discovery Program, with a few live animal helpers. “Moana” Interactive Movie Monday, June 17 | 10:15 a.m. Families & youth of all ages Registration required. Location: Prescott Room Bring the whole family to watch this popular PG-rated Disney movie in an interactive way! Every attendee will get a bag of props to use during the movie at specific times. Come in costume if you like, sing along with Moana and Maui, and have fun with us at the library. Art in Action Wednesday, June 19 or July 17 | 4 p.m. Ages 5 years and older No registration required. Location: Caldwell Plaza Join us for this exciting interactive art program. This will be messy, please dress accordingly. We will meet outside on the lawn by Caldwell Plaza. Storytime Yoga Tuesday, June 25, or Monday, July 22 | 10:15 a.m. Ages 3-5 years old No registration required. Location: Prescott Room Stretch your mind and body with this fun introduction to yoga. Bend and reach as we work our way through a book, learning basic poses, breathing techniques and new songs. Perfect for preschool through first grade. Wear clothes that you can bend and stretch in. Parents will need to be present. Some mats will be provided. Dan Dan the Magic Man Thursday, June 27 | 6:30 p.m. Families & Youth of all ages No registration required. Location: Prescott Room Join us for this out of the world experience loaded with humor, live animals, and tons of audience participation. This show will combine love of reading, magic and space to inspire you to dream big, believe in yourself and create your own story. LEGO® STEM — Magnet Mazes Thursday, July 11 | 4 p.m. Ages 5-11 years old Registration required. Location: Prescott Room Have fun learning about magnetism. We will be building LEGO® mazes and guiding our LEGO® figures through the maze using only magnets. Rolling Hills Zoo Discovery Program Friday, July 12 | 10:15 a.m. Ages 6-12 years old No registration required. Location: Prescott Room The Rolling Hills Zoo will give a presentation about animals and their habitats. Afterward, we will end with a craft. “Finding Dory” Interactive Movie Monday, July 15 | 10:15 a.m. Ages 4-9 years old Registration required. Location: Prescott Room You are invited to watch “Finding Dory,” a PG-rated movie about a forgetful fish hoping to reunite with her long-lost parents. Throughout the film, attendees will be given objects relating to the on-screen events in order to create an interactive experience! Watermelon Sensory Play Tuesday, July 16 | 10:15 a.m. Ages 18 months-3 years old No registration required. Location: Caldwell Plaza Nothing says summer fun like some watermelon sensory play! Join us as we "dig in" to some watermelons. This will get messy so dress accordingly. We will meet outside on the lawn at Caldwell Plaza. Denise Gard & Her Border Collies Thursday, July 25 | 10:15 a.m. Families & Youth of all ages No registration required. Location: Prescott Room Denise Gard brings stories to life using audience participation, her talented Border Collies, Sienna and Joey, and creative storytelling. Mother's Day Gifts Wednesday, May 1 or 8 | 4 p.m. Ages 8-12 years old Registration required. Location: Technology Center Learning Lab Come get crafty on the computer and make mom or grandma a gift they wonâ&#x20AC;&#x2122;t forget. Learning Games & Keyboarding for Youth Saturday, May 4 or 11 | 2 p.m. Saturday, June 1 or 8 | 2 p.m. Saturday, July 6 or 13 | 2 p.m.. Ages 6-12 years old Some additional Registration required. technology classes Location: Technology Center for older youth on Learning Lab Page 9. Sneak in some extra learning time by playing fun math and reading games. For those who want to learn or improve their keyboarding skills, an online program is available and individualized for each participant. Tiny Techs Wednesdays, May 29, June 5, 12, 19, 26, July 10 or 17 | 10 a.m. Thursdays, May 30, June 6, 13, 20, 27, July 11 or 18 | 10 a.m. Ages 5-8 years old Registration required. Location: Technology Center Conference Room Be like the big kids! Early learners get to play and on their way accidentally acquire technology knowledge. Summer Learning Monday-Thursday, June 3-6 | 9:15 a.m. Monday-Thursday, June 10-13 | 9:15 a.m. Monday-Thursday, June 17-20 | 9:15 a.m. Monday-Thursday, June 24-27 | 9:15 a.m. Monday-Thursday, July 8-11 | 9:15 a.m. Monday-Thursday, July 15-18 | 9:15 a.m. Ages 5-8 years old Monday-Thursday, June 3-6 | 11:15 a.m. Monday-Thursday, June 10-13 | 11:15 a.m. Monday-Thursday, June 17-20 | 11:15 a.m. Monday-Thursday, June 24-27 | 11:15 a.m. Monday-Thursday, July 8-11 | 11:15 a.m. Monday-Thursday, July 15-18 | 11:15 a.m. Ages 8-13 years old Registration required. Location: Technology Center Learning Lab Keep your mind sharp this summer and be successful in the upcoming school year! Using fun and engaging technology, participants will work with a licensed elementary teacher through math and reading curriculum. The program is individualized to meet the needs of all skill levels. Youth who continue throughout the summer will see marked progress. This is a weekly, four-session class that meets Monday through Thursday. Register on the first date of the class and you will be automatically enrolled for the rest of the week. Learning Adventures Monday, June 3, 10, 17 or 24 | 1 p.m. Ages 5-12 years old Registration required. Location: Technology Center Learning Lab Avoid the summer slide and maintain skill levels in math, reading and spelling. Working with a licensed elementary school teacher, youth will utilize interactive, high-quality, educational technology in various subjects. Progress is tracked and individualized for each participant. 3D Pens Tuesday, June 4, 11, 18 or 25 | 10 a.m. OR 11 a.m. Ages 8-12 years old Registration required. Location: Technology Center Conference Room Lift your imagination off the page with the 3Doodler 3D Pen. Participants will create fun objects to take home. Tech Art Tuesday, June 4, 11, 18 or 25 | 1 p.m. Ages 7-12 years old Registration required. Location: Technology Center Conference Room Get your creative juices flowing and make art from CDs and keyboard keys! Participants will take home their innovative creations. Be Internet Awesome Tuesday-Wednesday, June 4-5, 11-12 or 18-19 | 1:30 p.m. Ages 8-12 years old Registration required. Location: Technology Center Learning Lab To make the most of the internet, kids need to be prepared to make smart decisions. Be Internet Awesome teaches kids the fundamentals of digital citizenship and safety so they can explore the online world with confidence. This is a two-session class that meets on Tuesday and Wednesday. Register on the first date of the class, and you will be automatically enrolled for the second day. Father's Day Gifts Tuesday, June 4, or Thursday, June 6 | 3 p.m. Ages 8-12 years old Registration required. Location: Technology Center Learning Lab Come get crafty on the computer, and make dad or grandpa a gift they won’t forget. Snap Circuits Thursday, June 6, 13, 20 or 27 | 1:30 p.m. Ages 8-12 years old Registration required. Location: Technology Center Conference Room Using an innovative kit, participants snap together components to create working electronic circuits and devices. Snap Circuits provides hands-on education in how electrical circuits work to run everyday devices. A variety of projects can be completed such as a musical doorbell, an alarm circuit, two-speed fan, a light emitting diode, a sound activated switch and more! 3D Printing — Design a LEGO® Friday, June 7 & 14 or 21 & 28 | 10 a.m. Ages 10-12 years old Registration required. Location: Technology Center Learning Lab This is your chance to see how 3D printing is transforming our world. Teens will learn how to design a 3D custom-shaped brick to fit into other LEGO® system bricks. Each participant will get to print their 3D object and take it home. This is a two-session class that meets on Fridays. Register on the first date of the class, and you will be automatically enrolled for the second session. Ozobots â&#x20AC;&#x201D; Write Your Name with Ozocodes Tuesday, July 9 or 16 | 10 OR 11 a.m. Ages 7-11 years old Registration required. Location: Technology Center Conference Room Turn your name into a track for the Ozobot. Ozobot is a miniature robot that senses its environment to follow lines and colors. Participants will learn how to use Ozocodes so the Ozobot can track their name. Bloxels Tuesday-Thursday, July 9-11 or 16-18 | 3 p.m. Ages 9-12 years old Registration required. Location: Technology Center Learning Lab Create your own 2D video game including terrain, enemies and your hero. Use the bloxel board and pegs to imagine your world. This is a three-session class that meets Tuesday through Thursday. Register on the first date of the class, and you will be automatically enrolled for the rest of the week. Ozobots â&#x20AC;&#x201D; The Great OzoRace Tuesday, July 23 | 1 p.m. OR 2:15 p.m. Ages 7-11 years old Registration required. Location: Technology Center Conference Room Use ozocodes and program your Ozobot to win the race! Fast, easy, secure! Online registration begins at 9 a.m. April 23. Use your credit or debit card to enroll. You will receive an email confirmation for your registration. In Person: McKenzie Center, 308 W. Elm Bring your completed registration form (page 19) and payment to the McKenzie Center (north of the library) 9 a.m.-5 p.m. Monday-Friday beginning April 23. Dropbox: McKenzie Center, 308 W. Elm You may leave your registration and payment in our secure drop box, located on the front of the building. Registrations will be processed beginning on April 23 starting at 9 a.m. In-person and online registrations are processed first when registration opens. Turning your form in early does not guarantee your registration. Your registration is not secure until payment is received. 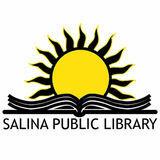 Friends of the Salina Public Library can register for CLASSes one day early. To take advantage of this benefit, you must be a current Friends member and visit the McKenzie Center from 9 a.m.-5 p.m. April 22. A 100 percent refund will be issued if you cancel your enrollment in the course one week before the course begins or if the course is canceled by the library. Refunds may require up to 10 days to process. No refund will be issued for cancellations made after seven days prior or for nonattendance. If you are dissatisfied for any reason with a course you have attended, we will gladly offer you a CLASS gift certificate for the cost of the course. If a course is canceled due to inclement weather, every effort will be made to reschedule the course. Contact McKenzie Center staff at (785) 825-4624, ext. 218, or class@salpublib.org. Interested in serving on our CLASS Advisory Board? Contact McKenzie Center staff, for more information. Basic Sculptural Welding & Metalworking Saturday, May 18 | 9 a.m.-1 p.m. Ages 18 years and older Register by May 11 Location: Salina Area Technical College, 2562 Centennial Rd. Fee: $30 In this class, you will transform sheet metal into a decorative steel flower to become the center point of your garden or a gift for a loved one. This class will be an opportunity to learn about basic welding technology and metalworking techniques. By cutting, shaping and working raw steel materials using heat and electricity, you will experience the fulfillment of producing a unique flower every time. At the end of this course, you will take your creation home to paint or let it weather the elements to achieve a rusty finish. Students will need to wear flame retardant (100 percent cotton) clothing and leather shoes or boots. Bring leather gloves. Salina Area Technical College (SATC) will loan students safety glasses for the day. Participants must be 18 or older. Spanish Conversation Club Meeting 1: Monday, May 20 | 6:30-8 p.m. Register by May 13 Meeting 2: Monday, June 17 | 6:30-8 p.m. Register by June 10 Meeting 3: Monday, July 15 | 6:30-8 p.m. Register by July 8 McKenzie Center, 308 W. Elm Fee: $6 per meeting or $15 for all three Explore Spanish language and culture in a friendly conversational environment. This club provides the perfect setting to practice your Spanish with a native speaker while answering your questions about Spanish culture and language. Tania Arias will be facilitating the club and tailoring it to the group’s interests based on goals set at the first meeting in May. Please note: this is not an instructional class and students should know some Spanish. Different experience levels are welcome to attend! *Charge will appear on your statement as “BT Salina” Liability release information This release is for any and all liability for personal injuries and property losses or damage occasioned by, or in connection with, this CLASS event. The undersigned agrees to abide by all rules and regulations set forth by Salina Public Library and/or its affiliate groups and vendors throughout the CLASS activity. In the event that the individual(s) registered in any CLASS sponsored program(s) is in need of treatment at any emergency room or medical care facility, the participant’s instructor, or any employee of Salina Public Library and/or other sponsoring agencies, has my consent to authorize my treatment for the participant(s) by the doctor(s) of their choosing as the doctor(s) may deem necessary. I, the undersigned, do hereby acknowledge that I have granted permission for me/my child to participate in any and all CLASS program(s) with full knowledge of the risks involved and I hereby agree to assume those risks and to hold Salina Public Library, other sponsoring agencies and all of their representatives free from liability for any injury, harm, or complication resulting from said participation in any and all program(s). Furthermore, I do understand that accident insurance is not provided by Salina Public Library and/or other sponsoring agencies, and I hereby agree to assume full responsibility for any and all medical expenses resulting from any accidents or injuries suffered by me and/or my child while participating in said program(s). I also acknowledge that Salina Public Library may take photographs of me/my child while participating in CLASS activities and I grant permission for the library to use said photographs for the purpose of promoting and informing the community about CLASS activities. Signature I have read and agree to all CLASS policies. Wondering what to read this summer? We've created a list of award-winners, best-sellers and staff picks to get you started. 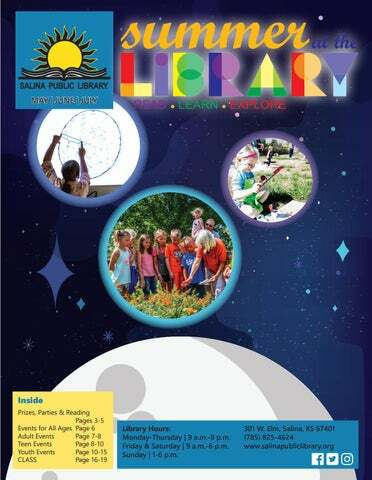 Events, classes and programs at Salina Public Library during May, June and July 2019.